July 2015 – He Said What?! Gary and I were working in our garden, tending the vegetables and yanking out the unwanted weeds earlier this spring when I looked over and noticed another area that needed tending. We have several tall Crepe Myrtles that are on the street side of the garden. It was early spring, and I saw that all of them were crowded with weeds. 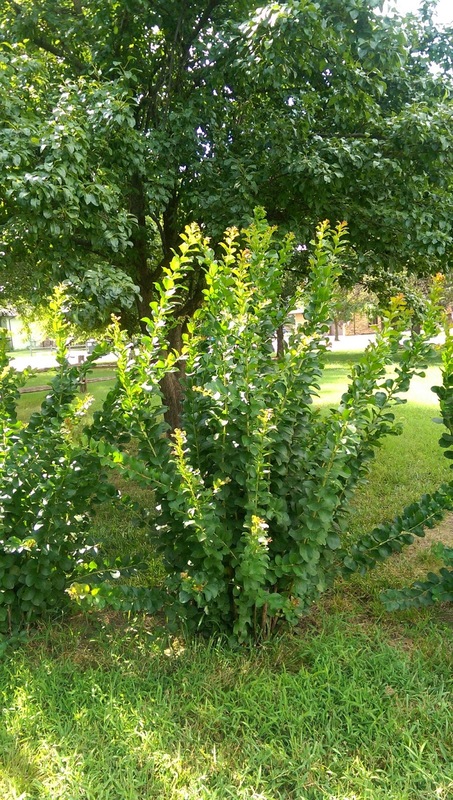 The weeds had become so thick that I knew if there was any hope of the Crepe Myrtles growing then I would need to pull those weeds…..sooner rather than later. After we finished the garden, I grabbed my little shears and I walked over to the row of Crepe Myrtles. It seemed that there were only weeds growing until I bent over to take a closer look. That’s when I saw that there were small new shoots of Crepe Myrtle poking through the thick weeds, trying hard to thrive but having to fight the persistent, fast growing weeds that threatened to crowd out their future growth. I began to do some snipping here and some cutting there, but I soon realized that I would need to slow down and take my work to a more personal level. 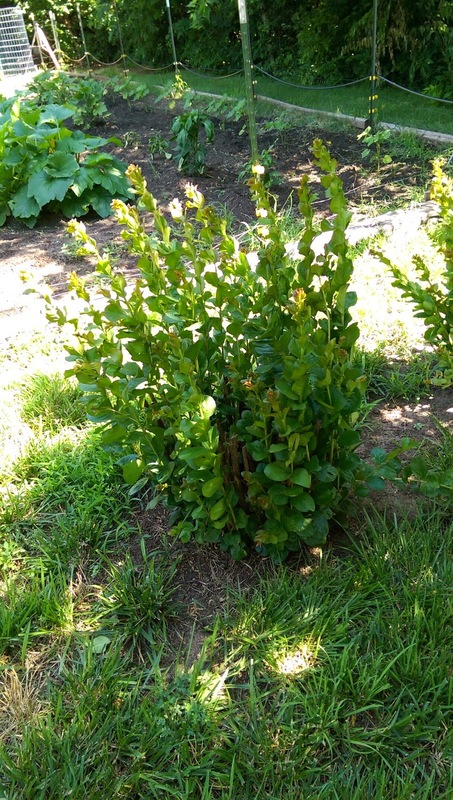 I got on my knees and slowly, carefully pulled more weeds from among the tender shoots of the bush that was trying so hard to grow. 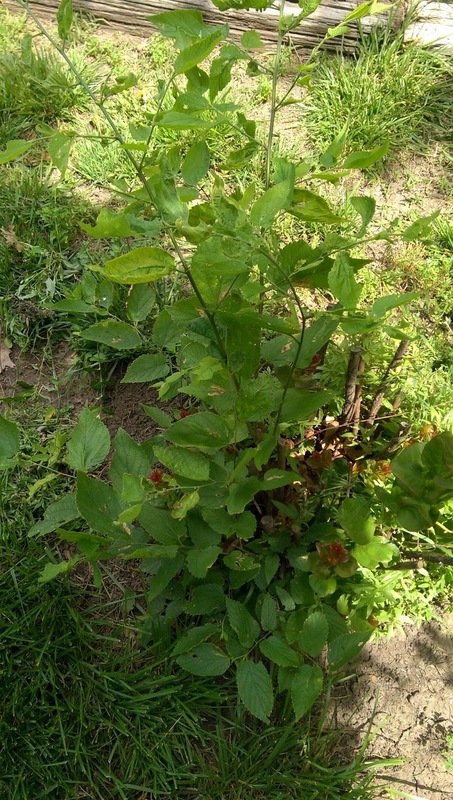 I didn’t want to pull the small green and maroon Crepe Myrtle growth from the ground, so I had to carefully identify each weed and then gently pull it from the ground by its roots. This was slow going, but it was worth it when I finally stood and looked down to see only pretty new Crepe Myrtle growth, unhindered now by the noxious weeds. Over the next few weeks I was very pleased to see the Crepe Myrtles getting taller and taller, thriving in the rain and the sun. They could grow now and show their beauty. And just yesterday, as I pulled weeds from around our vegetables in the garden, I looked over to our little row of Crepe Myrtles and was so happy to see how tall they were. How healthy they looked! They will bloom now any day, a little late this year, but we will enjoy their blooms regardless. I think I’ll enjoy those pretty fuchsia flowers even more this year as I think of how carefully I had to remove what was threatening to kill their beauty. This has been a rather difficult summer for me…..for our family. My mother passed away on May 4 and we buried her the Friday before Mother’s Day. Then in June Aaron was in the hospital for a week with pneumonia and other complications, and had a long recovery when he came home. I got sick a week after he got home, and am still finishing up my third round of antibiotics for that infection. Last week Andrea, in Houston, got pneumonia in both her lungs. Those have been big things, like the big weeds in the Crepe Myrtles. Sometimes the big things that bring exhaustion and discouragement are easier to deal with because they are so evident. We expect to be tired and downhearted from issues like death and severe sickness, or prolonged illness. We can identify the big problem and hopefully understand it as we deal with it, or as we ask others to pray for us over those matters. It’s out there for all to see, including us, and so we can talk about it and handle it. But deep in my heart, I’ve had another problem. It’s not out there for all to see, and is even difficult for me to adequately identify and then deal with as I should. I call it a spirit of discontentment. It’s a gnawing unhappiness that I find creeping up in my soul, threatening to choke out my joy and my growth. People can say, “Oh Patty, you’ve had such a hard time the last few months. It’s just so much to handle.” And while some of that may be true, I know better. I know better because I know my tendency to become discontent. I’m like the Psalmist who said, “Why are you cast down, O my soul, and why are you in turmoil within me?” (Psalm 42:5) I know myself very well, but I don’t always want to admit the problem. 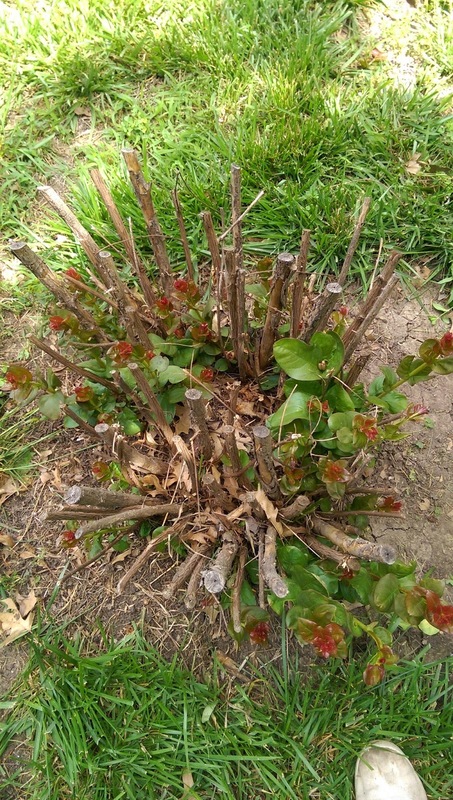 That’s when I need to get up close and personal, like I did when I was on my knees beside the Crepe Myrtles, pulling out each individual choking weed that was stunting needed growth. Sometimes it’s painful to identify the issue and to then take care of it in the necessary way, but it’s the only avenue to becoming content and peaceful once more. My discontentment begins when I take my eyes off of God and His sovereignty in my life. It’s when I allow myself the “luxury” of a wandering thought life. What if I had this? What if life was like that? Why don’t I do such and such? Why am I a failure? If only I did this or had that or accomplished something, then I would be happy. And as a woman, especially, that ugly comparing game. How often we do that, whether it’s about our house or our figure or our work or our children or our husbands…..
It’s all so defeating. And the bottom line with me, the very damaging weed that I need to get rid of the most, is an attitude of unthankfulness. Paul tells us to be thankful in everything. That means EVERY THING! Every situation, every day, every person in our life, every moment, can and should prompt us to be thankful. Even when we don’t feel like being thankful, there is always a reason for which to give thanks. We may have to look hard, but it’s a command to be thankful. Even if I can’t find a reason, I am still to be thankful to God for what He has allowed. For me, a thankful heart is like pulling out many weeds that are choking me. A thankful word on my lips and a thankful thought in my brain often takes a very conscious effort, but it does so much to sweep away that discontentment that makes me so down and miserable. After the Psalmist asked the question about his turmoil in Psalm 42:5, he finished by saying, “Hope in God! For I shall again praise Him, my salvation and my God.” Sounds simple, but we know it isn’t always so. Down on my knees I will go again and again, I am sure, to weed out the attitudes that are causing my discontent. Remembering to hope in God and not in my surroundings. And then knowing that I SHALL again praise Him, even if it’s while I’m on my knees doing that weeding and I don’t really feel like praising. But praise I should, for He is my salvation and He is my God. What a gift! There it is. Something for which to be thankful! I want to be growing into the beauty that God has for me, like my Crepe Myrtles are now growing. But I know it takes effort on my part to be obedient to what God tells me to do…..to be on my knees pulling out those weeds that are trying to destroy my joy. In other words, when I am cast down again….and I will be…..then I can remember the God who has strengthened and enabled me in the past. He is still here in my present situation, whatever it may be. Weeds always grow, but God is always faithful, too. And for that I am…..very thankful! I just smiled. I wanted to ask him about his other body, but instead I just enjoyed the unique way that Aaron describes things and expresses himself. And I’ve been thinking since then about how many different ways Aaron reacts to life around him. He has many ups and many downs. Sometimes it really is like he has various bodies. Then Gary and I feel like we have a variety of bodies, too, in any given day as we react to how Aaron is reacting. We do get jerked around a lot, waffling between pleasant moments and pulling-out-our-hair moments. Last Sunday, Aaron’s week started out nicely. He found something very special as we walked around the back yard. Only Aaron would find a turtle virtually hidden in our thick grass, up near our patio. I walked right past the turtle and then heard Aaron saying, “Look, MOM! !” I turned around to see him holding the turtle, poking his finger in to where the turtle was hiding his head as I warned him that he would get bitten. 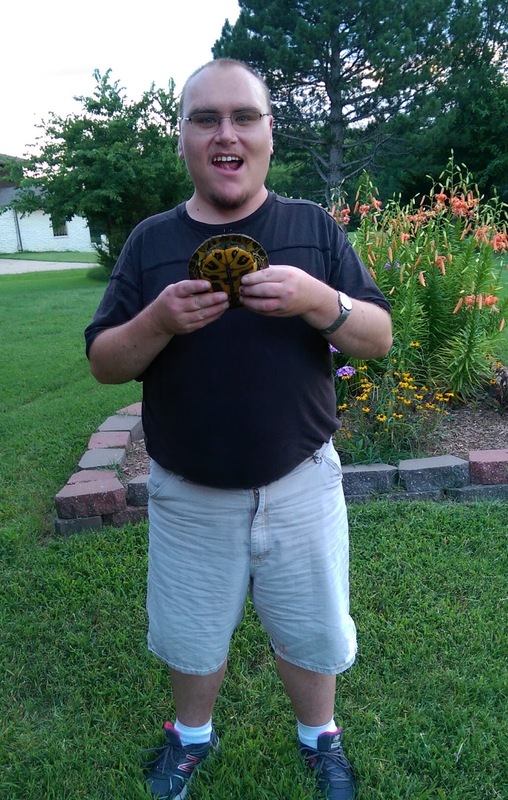 Aaron proudly held his find before he and Gary turned the turtle loose in the finger of the lake that comes onto our property. The turtle was still for a moment and then with a dive took off into the welcome water. Aaron was delighted, although he still was hoping he had found a turtle pet. Later that night he talked to both Andrea and Andrew on the phone. He always has to tell Andrea about his latest movie that he’s watching, describing it in detail. She always shows great interest whether she really is or not. I would say she’s usually not. Neither are we, honestly. I have no idea how many movies it is now that Andrea is either supposed to rent to watch, or watch with Aaron when she comes home. Aaron probably won’t forget. He talked to Andrew about racing, which is so unusual. There was a time when Aaron was very jealous of Andrew. He didn’t want to see him on ESPN when we watched an NHRA race, but now Aaron really enjoys seeing Andrew. It was fun to hear Aaron say, “Hey, Andrew, I see you on TV!” And Andrew acted surprised by that, to which Aaron affirmed that this was true. “Yes, I see you on TV!” So Andrew said, “Well, maybe someday I can wave and say hi.” Aaron’s face broke into a huge smile. “You would do that?” he asked. “You would wave and say hi on TV?” Andrew assured him that if he could ever do that, he would. “On TV? !” Aaron asked again. It was a sweet exchange between those two brothers. Aaron, who is the oldest, seeming again like the baby of the family in more ways than one. On Monday, I worried that Aaron would have a hard time going to Paradigm, but he did beautifully that day…..and all week, actually. After the huge adjustment of returning to his day group after being gone for a month while he was sick, this second week of smooth sailing was so welcome. Even with Bryan gone this week on vacation, which meant that Aaron wouldn’t be helping work on houses, he still had no problem going every morning. Except for a little on Friday, but more on that later. He came home on Monday in a very good mood. All was well and happy for our evening…..until I walked in the kitchen and saw him with a second glass of iced tea. I let him have one glass while we watch Wheel of Fortune, but he’s famous for trying to sneak in two glasses. I caught him in the act as he was putting the second glass to his lips, so I told him that the glass of tea was his special treat then. I wasn’t going to fix him anything else. And the tide turned. The mood darkened, dramatically. He became belligerent. The past few happy days came cascading down into defiance from Aaron. He hovered behind me on the computer, saying whatever mean thing he could think of without totally crossing the line. He gave his fake sinister laugh to add some effect. He would walk away for a minute, only to return and repeat his actions. I finally had Aaron come into Gary’s study and sit on the floor. Gary and I talked and talked to him, not seeming to really make any headway at all. It was just amazing to see how his thought processes just don’t process at all like ours do. He wasn’t connecting the dots in any way like we do. It was just another lesson in frustration for Gary and me. Another evidence of Aaron’s different bodies, if you will. How quickly he can go from joy to anger, and how tremendously hard it is to reason with him. Sometimes our bodies are tired, as are our spirits, and such was the case Monday night for Gary and for me. I’m thankful to have Gary by my side. He fills in many gaps for me, and I do for him as well. We’re a team…..a tired team on occasion. Finally that night, things calmed down and all was well when Aaron went to bed. We can only pray that something we said stuck in that brain of his. We know we have to keep trying. Aaron had times of showing compassion this week, which always makes us very happy because typically Aaron is all about Aaron. He told us that he gave one of his bean burritos to Jennifer, his friend at his day group. And he gave her his water, according to him. He wanted to take some zucchini from our garden to Barb, which he did. He’s been known to sneak produce out of the house in one of his deep pockets, but this time he did it with my permission. He does sometimes love to share. When we talked to Andrea later in the week, he was very concerned to find out that she was sick. She ended up having pneumonia in both lungs! He wanted to talk to her, but I resisted because I knew she really didn’t feel like it. But Aaron asked her right away if he gave her his sickness when we visited her in Houston, and he showed real concern for her. That was sweet to see. On Friday morning, I had to go to the air base for some routine blood work for my yearly physical. I left early, but the lab was busy and so it took me longer to get home than I had planned. I knew when Aaron called me, sounding very down and sluggish, that we were in trouble. It was confirmed when he said he didn’t want to go to Paradigm. I got home to find an angry Aaron, but a dressed Aaron. You see, his routine was all messed up because I hadn’t been at the house. He slept a little later than usual, had to get his own coffee, and was just generally unhappy about the whole state of affairs. But of all things, miracles happen, and Aaron ended up going to his day group willingly. Another crisis avoided! Then came seizures on Friday night/Saturday morning. Just three seizures and not as severe as they sometimes are, but still sad to see. Aaron’s body gets jerked around physically, that’s for sure. He slept later than usual yesterday morning, but woke up fully functional. That was a relief! Yet he was grouchy because of the seizures and not feeling well, so I had to tread lightly for awhile. Just another example of the many bodies of Aaron. He made me laugh this week, as he often does……some days more than others. One morning I told him it was time to leave, but he told me to wait a minute. I repeated that we needed to go and he told me again that he was almost done…..just wait a minute. 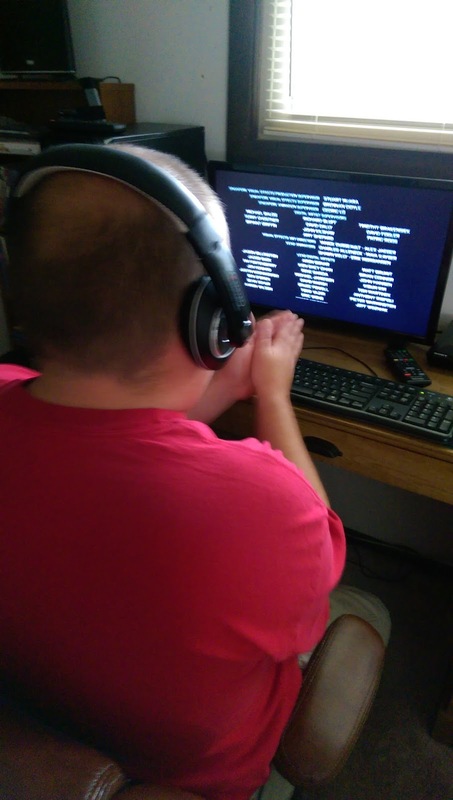 I looked in his room and found him, of course, watching the movie credits from the movie he just finished. He was rubbing his hands together, a sign of delight, and as always I laughed. The credits cannot be interrupted, so I waited until he was down to the very last word and then he happily turned the DVD off and away we went. Then today, as we watched racing and he tried to catch a glimpse of Andrew, he ended up sitting like this. 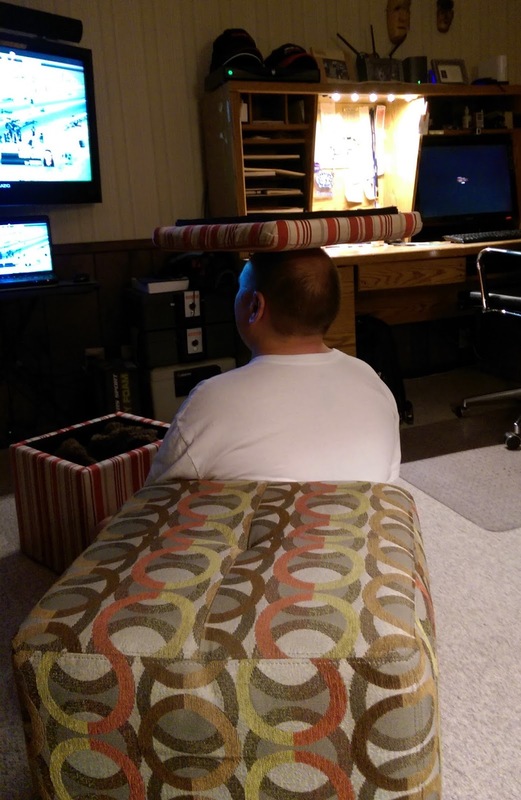 Yes, that’s our cushioned ottoman lid on his head. Good balance, don’t you think? But perhaps the sweetest thing was when we sat down for lunch today. He said he would pray, which he doesn’t often like to do. He almost always says two phrases when he prays. The phrases may vary, but there are almost always just two. Short and sweet. So we held hands and Aaron said, “Lord, thank you for this food.” He paused, then continued. That was his sweet body……and a sweet moment to cherish. The last blog I wrote told about Aaron’s difficulty in returning to his routine. 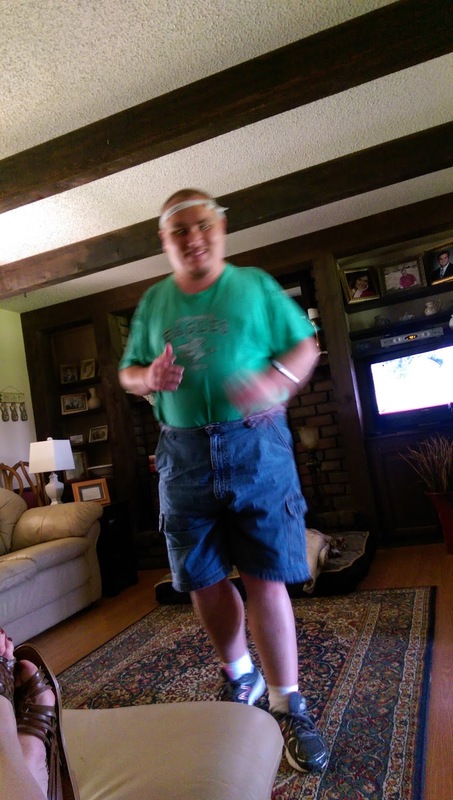 He had a very difficult three days as he adjusted to leaving the house every morning and going back to his day group. Monday wasn’t too bad, Tuesday was awful, and Wednesday was very “iffy.” I wrote about Tuesday……the slumped shoulders, sitting in the rocks, actually throwing some rocks, etc. On Wednesday, I went into the building ahead of Aaron because he said he wasn’t getting out of the van. I just got out and headed inside, and so he followed me. He talked to Barb, who knows how to calm him, but he kept saying he wasn’t going to stay. Barb said she would just drive Aaron in her truck over to where Bryan was working on a house, so Aaron walked outside with her, all the while saying that he was NOT staying at Paradigm. I just stayed mostly quiet. Aaron stood at our van, but finally went with Barb and then had a good day. I drove away just asking God for wisdom, patience, and strength. We ask God often for those three things when it comes to Aaron. Later Barb and I texted. She said Aaron was totally fine the rest of the day. I told her that I think he is testing me, and she said that they would do everything they could to see that I passed the test. And the staff at Paradigm truly does just that. They know Aaron, and they know how to work with him….how to calm him……how to understand what’s behind his actions, when they can understand. Sometimes no one can figure him out. Bryan and Aaron worked together all week on different house projects…..residential settings that Paradigm manages. Aaron was quite proud of the fact that he helped Bryan put tile down on a floor, but on Thursday he brought a piece of the “tile” home and we saw that it was actually laminate flooring. It wasn’t long before Aaron had given me a resounding whack on my rear with his little plank, and he got a good lecture from me. I learned the next day that he had done the same to Barb. He just never seems to get it…..rarely is able to control those impulses. “I think it’s weird,” Aaron flatly replied……which made me laugh……which Aaron also thought was weird. He’s so funny. Last night he was watching an alien movie in his room, having a blast. But when he came downstairs and saw a sweet family scene on the movie “McFarland,” he said, “That’s weird!” So for Bryan to call him his number one man seems weird to Aaron, but deep down I think Aaron loves it. He just doesn’t know how to convey that sentiment like we do. Just like he doesn’t know how to handle his frustrations over returning to real life after a month away. Instead of sitting and having a conversation about it, he has to yell and threaten and cry and throw rocks. Then our frustrations mount, and we have to be so careful how we handle it. I’ll admit that it gets old. Gary and I were talking about it last night. We really don’t know what a “normal” life is at our age. Other parents of children, young or adult, with behavior issues know exactly what I mean. Yet there aren’t many great alternatives, and we do love Aaron. God gave him to us, so we just take one day at a time. And we are ever thankful for people, like the staff at Paradigm, who work so well with Aaron and help us on this journey. We see progress with Aaron, but his core issues will probably always be the same. I’ve always tried to see the humor in so many things that he says and does. Sometimes I don’t have to look hard, for he truly is so funny so often. On Friday, our electricity went off a couple times, so Aaron’s clock by his bed was messed up. As I was helping him get everything ready for bed, he asked me if I would set his clock. I told him to look at his satellite clock beside his desk and tell me the exact time so that I could get it right on his night stand clock. “OK, Mom. It’s 10:05,” he said. So I punched the buttons for the hour. Then I did the same for the minutes. “It’s 10:06 now, Mom!” he told me. And wouldn’t you know, I punched just one too many and the clock said 10:07.
Who was I kidding?! And I knew it. He just stood there staring at his clock. And I knew that one minute did matter. It mattered very much to Aaron. He can halfway brush his teeth. He can wear the same pair of socks for days in a row, seriously, if I don’t catch him. But one minute too fast on his clock is not tolerable. Not at all. So I hurried and re-punched the buttons, but by then it was nearly 10:07. And he began counting the seconds. And when he said “60!” and the time was now officially 10:07, I punched the little button very carefully, ONE time, and then all was well. It was 10:07 on his nightstand clock and on his satellite clock. They were synced correctly, and now Aaron could go to bed. If only he would sync his life to ours as easily! If we could just punch a button here and a button there, and make us all line up together in harmony…..wouldn’t that be awesome? But I know if we did that, then we would also miss a lot along the way. Like I told Gary last night, even in the midst of our tiredness and sometimes deep frustrations, we really can look at many amazing facets of Aaron. We just need to remind ourselves of that on some days when no matter how many buttons we push, things just don’t line up the way we want. Honestly, on many days we end up syncing ourselves to Aaron. We can pretty well predict how he’ll react to different situations, and what he’ll say. He doesn’t sync himself to us nearly as well, but when he does it’s cause for celebration. Like how he made it through this week and the expectations that were made of him. It was a huge accomplishment for Aaron! But tomorrow morning may be another story. I need to remember that ONE minute. From Online Asperger’s Syndrome Information and Support (O.A.S.I.S. ): Individuals with Asperger’s are easily overwhelmed by minimal change….. MINIMIZE TRANSITIONS. Guess what we are in the middle of with Aaron? Aaron returned to his day group, Paradigm, yesterday – almost a month to the day after he entered the hospital for a week. After returning home from the hospital, he had doctor appointments…..he had lots of healing to do……lots of strength that needed to return…..and setbacks, like his rash last week that needed to be treated. We also took a trip to Houston over the Fourth of July, spending five fun days with Andrea and on the road. Life was good for Aaron, especially after he started feeling better. He loves nothing more than staying home with his computer and movies and games and television. Throw in an occasional shopping trip, eating out or bringing in take-out, and what’s not to like? I’ll tell you what’s not to like. Returning to the real world, to a schedule, and to Paradigm is what’s not to like…..for Aaron. One evening I was in Aaron’s room as he got ready for bed. I had helped with putting Mr. Snake, Mr. Skunk, and Mr. Frog in his bed. Every bit of each stuffed animal must be just perfect, placed exactly where Aaron’s unwritten rules say they should go. I thought I had them perfect, but they were just a tiny bit “off” and so Aaron pulled back the covers I had pulled up, and he rearranged them just the very littlest bit. No truer words were ever spoken! This describes Aaron better than any concise statement I could have ever tried to formulate. Aaron wants things the way he wants them. I guess we all do, really. But for Aaron, as with so many autistic individuals, the desire is carried to the extreme at times. Many times, in many ways. It’s very difficult to dissuade Aaron from wanting things the way he wants them, too. And to accept the fact that life doesn’t always allow him to have things the way he wants them. Staying home has always been the way Aaron wants his life to work. So being home for all these weeks was just the best case scenario for our Aaron. Going back to Paradigm is the worst thing, in his mind, that could have happened. And it happened. It’s happening now. And we are hanging on for the ride. Yesterday wasn’t bad. Aaron was a little reluctant about going, but he and I walked into Paradigm with Aaron beaming. He loved seeing Barb and Brandy, and later seeing Bryan. He loved his friends saying, “Hey Aaron! We missed you!” He loved telling them about his trip to Houston. He loved going with Bryan to help lay tile at a Paradigm house, and eating lunch at Wendy’s. When he came home, he told me all about his day. He showed me his receipt from Wendy’s. He pulled out a business card from his pocket that he had gotten at a building supply store with Bryan, and he added it to his other business cards that he has confiscated over the years. He also pulled out of his other pocket some change that he said he found on the floor at Paradigm. He listened to my skeptical response. He pulled out his billfold. Finally his pockets were empty, and he went happily about his evening. But today…..today wasn’t good. Aaron didn’t want to go this morning. He made that known at home by continually telling me that he wasn’t going today. Finally he got in the van, and he was fairly pleasant on the way to Paradigm, although still saying that he didn’t want to go. I’ve talked to him about a special meal on Friday to celebrate his first return week to Paradigm, but he told me this morning that he didn’t care about a special meal. It’s best when Aaron is like this to just keep my affect as low as possible. If I react strongly, then he will react even stronger. Trust me….I have learned this. So the less I talk, the better. The less I react, the better. I may tell him I’m sorry, or that I understand, but trying to lecture or to make a point is useless. When Aaron is in his “I want things the way I want them” mood, then it’s best to be as quiet as possible. I pulled up to Paradigm. Aaron crossed his arms and refused to budge. I calmly urged him to go on in and start his day. After a short time, he opened the door and got out, but his face was a picture of real anger. 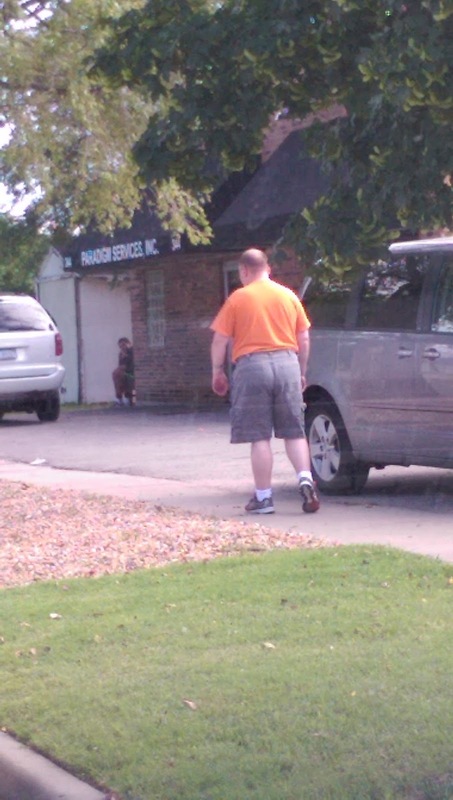 He slammed the van door, and then walked with sloping shoulders, slowly, up the sidewalk. He looked like the weight of the world was on his young shoulders. Then he stopped, and sat down in the rocks beside the sidewalk. Melinda was just going in, so she stopped and talked to Aaron. I decided to drive away as Melinda and I waved. I guess that she talked to Aaron awhile, and then Brandy came out to talk to him. She sat in the rocks with him, on his level, and he cried…..a sure sign of great frustration. They went on a drive and Aaron calmed. Bryan came back to Paradigm to pick Aaron up and take him to help him lay tile again, I assume. Aaron enjoys helping Bryan with house jobs. And I’m thankful for the gentle care that the staff at Paradigm gives to Aaron. Their understanding, and the fact that they “get” Aaron, is a great relief to us. I hope that Aaron’s having a good day. I suspect that he’ll come home happy again, full of talk of his day. I don’t know what tomorrow will hold when it comes time to walk out the door again and face another day. Aaron’s greatest challenge in life is to learn how to process change…..how to transition from one way to another way. Sometimes he surprises us. In Houston, when we would tell him of our day’s plans, he would automatically say, “No!” No to the beach…..no to the boat ride…..no to shopping, although we totally expected that. But it was easier for Aaron to want to stay in his comfortable world, watching his movies at Andrea’s apartment and playing with her dogs. Yet when he went to the beach he loved it. He loved the boat ride. He endured the shopping. And of course, he loved eating out! I’ve reminded him of how he said no to things, and then how he really enjoyed those things once he did them. This fact seems to mean nothing to Aaron now. His mind is closed to this idea. He wants things the way he wants them. And our job is to be patient, to not give in to his wants, to not lose our cool, and to ask God for lots of wisdom. If only Aaron wanted things the way I want them!! Yeah, I laughed at that, too. Friday, June 19, marked a full week that Aaron had been in the hospital for low sodium and pneumonia. He was feeling better that morning. He still had a wicked cough, but his fever had been gone for over 36 hours and he was generally feeling much better. In fact, the better he felt the grouchier he became. As he felt better, he missed home more. He missed his life and his routine. He was more alert and aware of how abnormal this hospital life was for him. So the better that Aaron felt, the harder he made life for those who were caring for him. All he could talk about that morning was going home. He didn’t like anything that anyone tried to do for him, including me. He tolerated his chest X-Ray, his pills, and his other morning interruptions…..barely. I saw his doctor in the hall and told her that she better put on her very thick skin when she came to see Aaron that morning. She just laughed, and I told her I wasn’t kidding. Aaron was grouchy, in all caps. GROUCHY!! And wanting one thing…..home! So later she came in with a huge smile, and of course Aaron told her immediately that he wanted to go home. She told him that she had good news for him, then, because home is where she said he could go. Then he smiled along with her, for the first time that morning, and life was good again. Of course, when one of the aids came in a few minutes later, Aaron looked at her and said, “I don’t need you now!” And I made him apologize, even as she just laughed and knew that Aaron was very happy to be leaving. He just had a very blunt way of letting that fact be known. The Occupational Therapist came in to give Aaron a shower and try to give him some shower pointers, but he actually just showed her how he showered and didn’t really listen to much of what she said. Physical Therapy had Aaron walk up and down the stairs one time, which he willingly endured because it was just another block to check before he headed out the door. Soon the wheelchair containing happy Aaron was on the elevator, along with our cart full of a week of accumulated “stuff”, and before long we were in the van, waving goodbye to the nurses and driving away. Going home at last! But a stop at McDonalds was first as Aaron asked for a burger and fries on the way home. We picked up lunch, and headed home to eat and to settle in to the life that Aaron had missed. Aaron was very, very weak. He needed lots of help with walking, with stairs, and with the bathroom. He was home, but life wasn’t going to be normal for some time. He finally ate, and slowly we made it upstairs to his room. He was so happy to be there at last. He wanted to watch his new Tremors movie for real, on his DVD player instead of the portable player. So he sat down in his chair, and he got his things around him fixed just right. His clock next to his desk had to be positioned just so. The items that he keeps near him on his bed were placed just right, with his stack of books on the corner of the bed. On top of those was his notebook in which he kept his record of what movie chapter he was watching. His pen was placed precisely on top of the notebook. 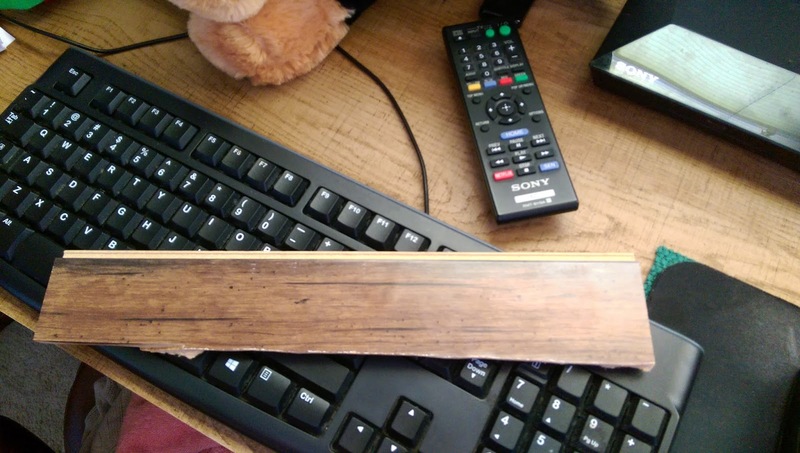 His back scratcher was set beside that pile of books. His Gecko from Glenda was settled in front of his clock. He looked around and checked to see that things were exactly as he wanted them as I stood behind him silently watching, and silently marveling at his precision with every item. Then he saw a DVD that needed to be put on his shelf of DVDs. He asked if I would put it there, so I leaned over and placed it at the end of the row. He just stared at it, and I waited. Nope. It wasn’t right. So I repositioned it several times before finally finding that he wanted it leaning a little at the top, and he wanted his special large rock to be placed near it so it wouldn’t slide out of place. There! It was finally according to Aaron’s specifications, and I was free to leave while he watched his DVD, content that all his things were in their perfect place as they should be. At home. Where he should be, and where he was so happy that at last he was there. Aaron spent much of that first weekend sleeping in his chair in the family room, his animal print blanket stretched over him. He coughed a lot, and he tried to walk by himself, but it was very slow going. He needed lots of help with everything. Coming home was wonderful, but it didn’t mean that Aaron was well and strong right away. For that reason, he was pretty disappointed. He loved being home, but he wanted his old body back as much as he wanted his old life back. Both would take awhile to return to normal, and despite our reminders and assurances, Aaron had some frustrations. “I’m just so tired of myself!” he blurted out on Saturday, overcome with frustration at his weak body. That made us so sad, but we could only offer encouragement that every day would be better. And it was. He enjoyed visits from friends, including Rosa and her mother, Louise…..complete with pizza and balloons! 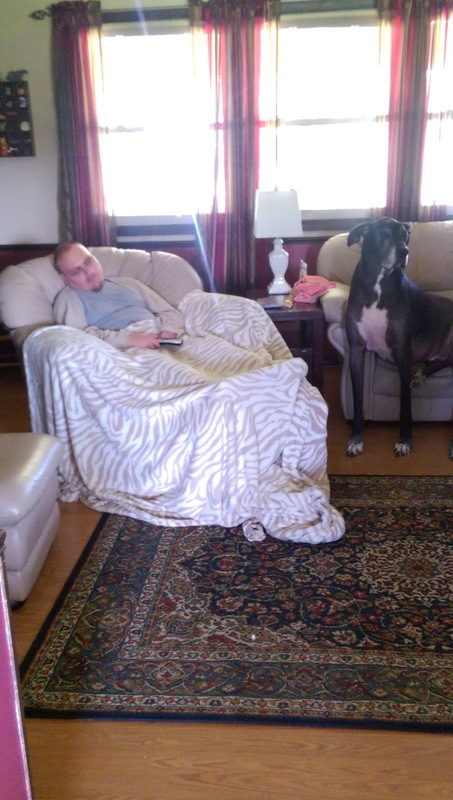 He enjoyed his room and his family room chair, watching Wheel of Fortune, and being with Jackson, and just everything. And each day was better than the one before. Each outing found him getting a little stronger, his stamina increasing slowly but surely. 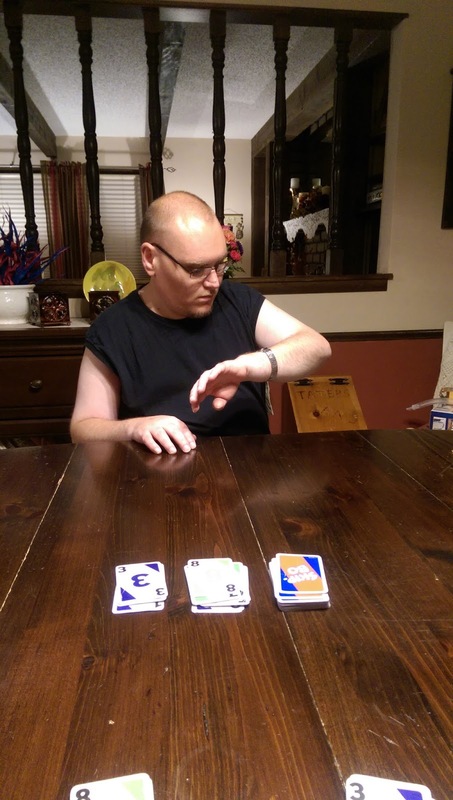 After several days, he and I played Skip-Bo, with Aaron checking his watch to keep track of time, just like always. Perhaps what he loved the very most, and what he had missed the very most while in the hospital, was his own comfy bed. The first night back at home, when it was time for bed, I was helping him get everything ready. 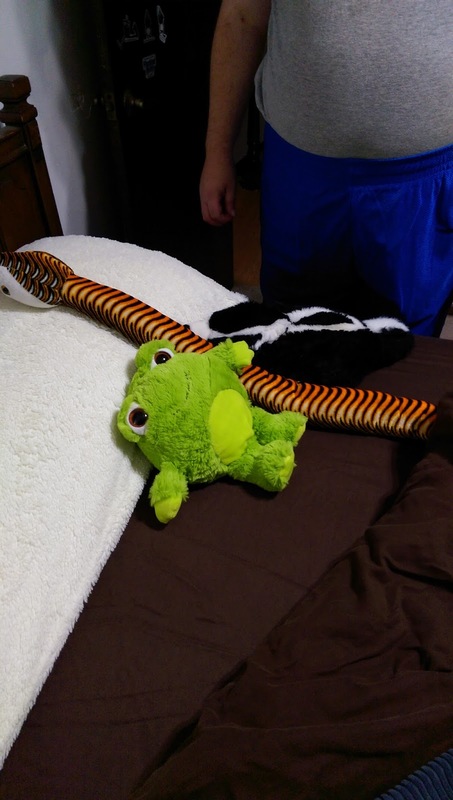 Every blanket was perfectly placed, every wrinkle straightened out, the pillow put just in the right place, and then the sheets were pulled back so that he could place his snake and his skunk under the covers. But now he had decided to add a new member to the mix. He wanted to add the soft green frog that Andrea had sent him while he was still in the hospital. 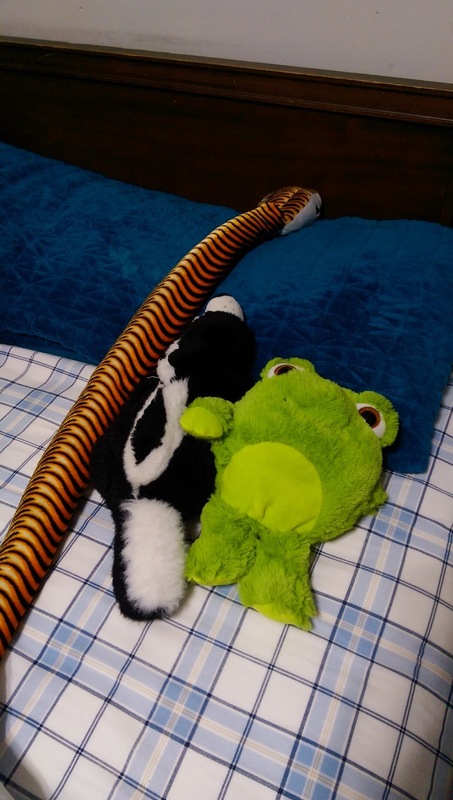 So he rearranged Mr. Snake and Skunk in order to make room for Mr. Frog, stood back to observe and to rearrange, and finally he was satisfied. He climbed in his bed, after writing his “Time to Bed” in his log book, and I pulled his covers up around his face. Then he smiled the sweetest smile in the world as he moved his legs back and forth in his wonderful bed that wasn’t a hospital bed. He was the picture of utter contentment. He pulled his arms from under the covers and held them up to me, so I leaned down and gave him a goodnight hug. “Good night, Aaron,” I said as I hugged him. I arranged the covers up around his face again, and there was that smile. He looked at me for a few seconds. What a precious moment! Of course I said yes, and so out of the covers came his outstretched arms. I leaned down to hug him one more time, thankful that our Aaron was home in his own bed. The hospital stay was scary. His health was uncertain. The outcome was unknown for days. I had stretched my arms on this bed days earlier as I asked God to heal him. Now here Aaron lay, smiling and hugging, wanting to say good night twice. It was his way of telling me how very happy he was to be home. I understood and I agreed. I left Aaron to his dreams. And I didn’t go to sleep until I thanked God that on this night, I got to say good night to Aaron in his own bed…..twice!